by Chris Woodford. Last updated: August 1, 2018. How many holograms have you got in your pocket? If you're carrying any money, the answer is probably "quite a few." Holograms are those shiny, metallic patterns with ghostly images floating inside them that help to defeat counterfeiters: they're very hard to reproduce so they help to stop people printing illicit copies of banknotes. Credit cards usually have holograms on them too and software packages also frequently have hologrammatic seals to prove their authenticity. What else can you use holograms for? Let's take a closer look at what they are and how they're made! 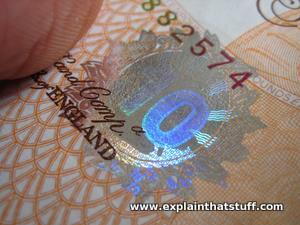 Photo: The security hologram on a banknote helps to stop people making fake copies. Holograms are harder to reproduce than other security devices. How can you store a beam of light? Light is an amazing form of energy that zaps through our world at blistering speeds: 300,000 km (186,000 miles) per second—enough to whip from the Sun to Earth in just over 8 minutes. We see things because our eyes are sophisticated light detectors: they constantly capture the light rays bouncing off nearby objects so our brain can construct an ever-changing impression of the world around us. The only trouble is that our brain can't keep a permanent record of what our eyes see. We can recall what we thought we saw, and we can recognize images we've seen in the past, but we can't easily recreate images intact once they've disappeared from view. Back in the 19th century, ingenious inventors helped to solve this problem by discovering how to capture and store images on chemically treated paper. Photography, as this became known, has revolutionized the way people see and engage with the world—and it gave us fantastic forms of entertainment in the 20th century in the form of movies and TV. But no matter how realistic or artistic a photograph appears, there's no question of it being real. We look at a photo and instantly see that the image is dead history: the light that captured the objects in a photograph vanished long ago and can never be recaptured. 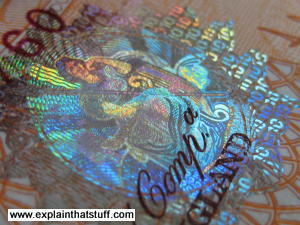 Photo: Tilt this banknote hologram and you can see the picture change. Tilt it one way and you can see the number 10 (it's a British £10 note); tilt it the other way and you can see the image of a mermaid. "The photographic record obtained with optical apparatus of [this] kind... has been termed a 'hologram' and this name will be used hereinafter." Holograms are a bit like photographs that never die. They're sort of "photographic ghosts": they look like three-dimensional photos that have somehow got trapped inside glass, plastic, or metal. 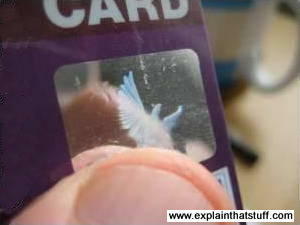 When you tilt a credit-card hologram, you see an image of something like a bird moving "inside" the card. How does it get there and what makes it seem to move? What makes it different from an ordinary photograph? Suppose you want to take a photograph of an apple. You hold a camera in front of it and, when you press the shutter button to take your picture, the camera lens opens briefly and lets light through to hit the film (in an old-fashioned camera) or the light-sensitive image sensor chip (the CCD or CMOS chip in a digital camera). All the light traveling from the apple comes from a single direction and enters a single lens, so the camera can record only a two-dimensional pattern of light, dark, and color. If you look at an apple, something different happens. Light reflects off the surface of the apple into your two eyes and your brain merges their two pictures into a single stereoscopic (three-dimensional) image. If you move your head slightly, the rays of light reflected off the apple have to travel along slightly different paths to meet your eyes, and parts of the apple may now look lighter or darker or a different color. Your brain instantly recalculates everything and you see a slightly different picture. This is why your eyes see a three-dimensional image. A hologram is a cross between what happens when you take a photograph and what happens when you look at something for real. Like a photograph, a hologram is a permanent record of the light reflected off an object. But a hologram also looks real and three-dimensional and moves as you look around it, just like a real object. That happens because of the unique way in which holograms are made. How do you make a hologram? You make a hologram by reflecting a laser beam off the object you want to capture. In fact, you split the laser beam into two separate halves by shining it through a half-mirror (a piece of glass coated with a thin layer of silver so half the laser light is reflected and half passes through—sometimes called a semi-silvered mirror). One half of the beam bounces off a mirror, hits the object, and reflects onto the photographic plate inside which the hologram will be created. This is called the object beam. The other half of the beam bounces off another mirror and hits the same photographic plate. This is called the reference beam. A hologram forms where the two beams meet up in the plate. Photo: The dove on this credit-card hologram seems to rotate as you tilt the card in the light. Laser light is much purer than the ordinary light in a flashlight (torch) beam. In a flashlight beam, all the light waves are random and jumbled up. Light in a flashlight beam runs along any old how, like schoolchildren racing down a corridor when the bell goes for home time. But in a laser, the light waves are coherent: they all travel precisely in step, like soldiers marching on parade. When a laser beam is split up to make a hologram, the light waves in the two parts of the beam are traveling in identical ways. When they recombine in the photographic plate, the object beam has traveled via a slightly different path and its light rays have been disturbed by reflecting off the outer surface of the object. Since the beams were originally joined together and perfectly in step, recombining the beams shows how the light rays in the object beam have been changed compared to the reference beam. In other words, by joining the two beams back together and comparing them, you can see how the object changes light rays falling onto it—and that's simply another way of saying "what the object looks like." This information is burned permanently into the photographic plate by the laser beams. So a hologram is effectively a permanent record of what something looks like seen from any angle. What can we use holograms for? 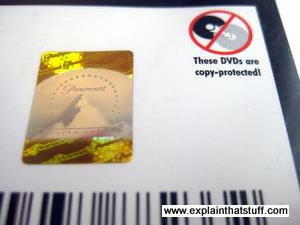 Photo: The hologram on this DVD case is designed to deter copyright piracy. Until the 1980s, holograms were a slightly wacky scientific idea. 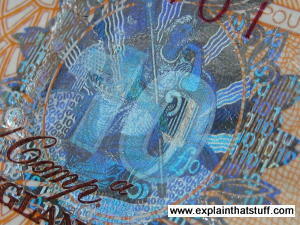 Then someone found a way of printing them onto metallic film and they became an incredibly important form of security. Proper glass holograms look much more impressive than the tiny metallic ones you see on banknotes and credit cards and you often see them used in jewelry or other decorative items: you can even have holographic pictures hanging on your wall with eyes that really do follow you around the room! In the 1980s, a British theater even projected a hologram of Laurence Olivier on stage to save the actor (who was, by then, quite elderly) the hassle of appearing in person each night. Lots of artists have experimented with making holographic pictures, including the Spanish surrealist Salvador Dali. Holograms also have important medical and scientific uses. In a technique called holographic interferometry, scientists can make a hologram of something like an engine part and store it as a "three-dimensional photograph" for later reference. If they make another hologram of the engine part at some later date, comparing the two holograms quickly shows up any changes in the engine that may indicate signs of wear or impending failure. No-one's yet found a good way of making moving pictures with holograms, but it's probably only a matter of time. Once that happens, we can look forward to three-dimensional holographic TV and a whole new era of super-realistic entertainment! Artwork: Dennis Gabor's original sketch of his 1950s holographic apparatus. Monochromatic light (yellow) enters at the bottom (1), passes through various prisms (blue) and lenses (gray) and is split into two beams. The low-intensity object beam on the left passes through the specimen on a slide (red, 10); the high intensity reference beam on the right continues in parallel without touching the specimen. The beams are recombined in a photographic plate (21/22) at the top after passing through more lenses (gray) and prisms (blue). Artwork from US Patent #2,770,166: Improvements in and relating to optical apparatus for producing multiple interference patterns by Dennis Gabor, courtesy of US Patent and Trademark Office. Holograms were invented by a brilliant Hungarian-born physicist named Dennis Gabor (1900–1979) while he was working in the UK. He'd been researching optical physics in the 1940s, and carried out his breakthrough work in holography in the early 1950s. The remarkable thing about his invention is that it was many years ahead of its time: lasers, which made holography practical, did not appear until the 1960s. As Gabor's many patents show, he was a prolific inventor with wide-ranging interests across many different areas of physics. In the 1930s, he invented new kinds of electron multipliers and cathode-ray tubes; in the 1940s, he was experimenting with photography and projection, which set him on the road toward holography; later inventions included composite fabrics for use in television equipment, and various innovations in recording and transmitting sound. Towards the end of his life, Gabor's brilliant contribution was recognized by the award of the world's top science prize, the Nobel Prize in Physics 1971, "for his invention and development of the holographic method." The Hologram: Principles and Techniques by Martin J. Richardson and John D. Wiltshire. Wiley/IEEE Press, 2018. An interesting and engaging mixture of history, science, and practical, hands-on technology. Optics by Eugene Hecht. Pearson, 2016. This classic undergraduate textbook is a good place to start for a general grounding in light and optics. The Complete Book of Holograms by Joseph Emil Kasper and Steven A. Feller. Courier Dover, 2012. 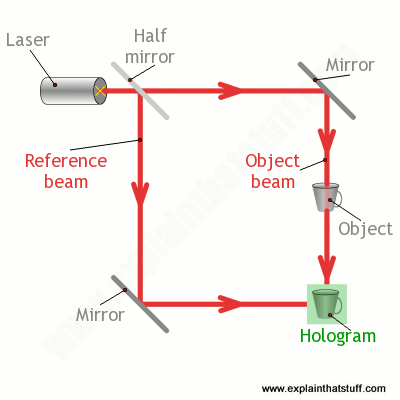 Basics of Holography by P. Hariharan. Cambridge University Press, 2002. Holography: A Practical Approach by By Gerhard Ackermann, Jürgen Eichler. Wiley, 2007. World's Thinnest Hologram Promises 3D Images on Our Mobile Phones by Dexter Johnson. IEEE Spectrum, May 19, 2017. Researchers demonstrate a way of making much smaller holograms. Andy Kaufman and Redd Foxx to Tour, Years After Death, as Holograms by Dave Itzkoff. The New York Times, October 23, 2015. Holograms are being used to resurrect dead comedians, but does that disrespect their legacy? Graphene Could Enable Holographic 3-D Imaging on a Mobile Device by Dexter Johnson. IEEE Spectrum, April 27, 2015. How graphene might be used to make a wide-angle, 3D, holographic display on smartphones. Holograms could soon give virtual meetings new life by Roger Yu, USA Today, February 24, 2011. Holograms Deliver 3-D, Without the Goofy Glasses by Ann Eisenberg, New York Times, December 4, 2010. Holography: Out of the Lab at Last: Popular Science, March 1984: How people were getting excited about holograms over a quarter century ago! The Nobel Prize in Physics 1971: Nobel Lecture: Dennis Gabor: Read what the pioneer of holography had to say about his own invention in the lecture he gave on December 11, 1971. US Patent #2,770,166: Improvements in and relating to optical apparatus for producing multiple interference patterns by Dennis Gabor, NRDC. Filed June 30, 1952, granted November 13, 1956. 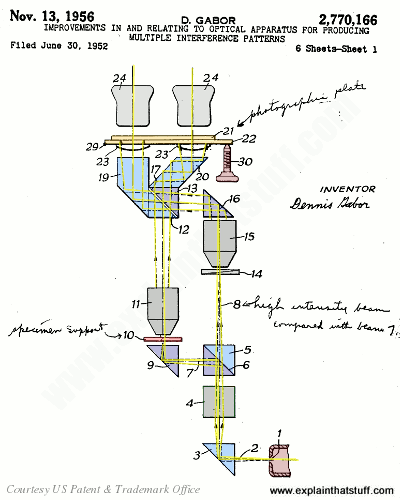 Read Dennis Gabor's technical description of holography in his patent application from the 1950s. US Patent #3,561,838: Holographic imaging by Dennis Gabor, CBS. Filed March 24, 1967, issued Feb 9, 1971. One of Gabor's later patents, outlining a simpler way to produce higher-quality holographic images. Lippmann's and Gabor's Revolutionary Approach to Imaging by Klaus Biedermann. Compares the work of Dennis Gabor on holography with Gabriel Lippmann's work on color photography. Tutorials for making holograms in home and school: A collection of handy how-to articles from Integraf. Hologram from LCD Projector by Baybren, Instructables.com. How to project a low-resolution "hologram" with an ordinary TV projector.